Tuesday, 5 August 2014: One Year, One Hundred and Twenty Seven Days Old. Ayla became a human pincushion today when we took her to get blood tests… Twice. Ayla had tests done about 10 days ago but she didn’t seem to recognise the situation when Hubby and I took her in this morning. Ayla was all smiles and oblivion as the needle went in, but her little face quickly twisted in pain and devastation while she sat on Daddy’s lap surrounded by nurses. The attempt was unsuccessful and we were told to come back later to try again, after making sure Ayla had had plenty of food to eat and water to drink. So the afternoon rolled around and I was anxious about having to put my baby girl through that again. We arrived and Ayla remembered her earlier experience, reaching out to me and crying whenever a nurse came to talk to her. The nurses tried again, unsuccessfully, to find the vein, jabbing my darling girl in her other arm this time, the one that was still bruised from a week and a half ago. Hubby and I called it quits, deciding it wasn’t worth a third attempt, at least for a while. We felt so guilty and sad for Baby Ayla that we did what all guilty parents do; we spoiled her. 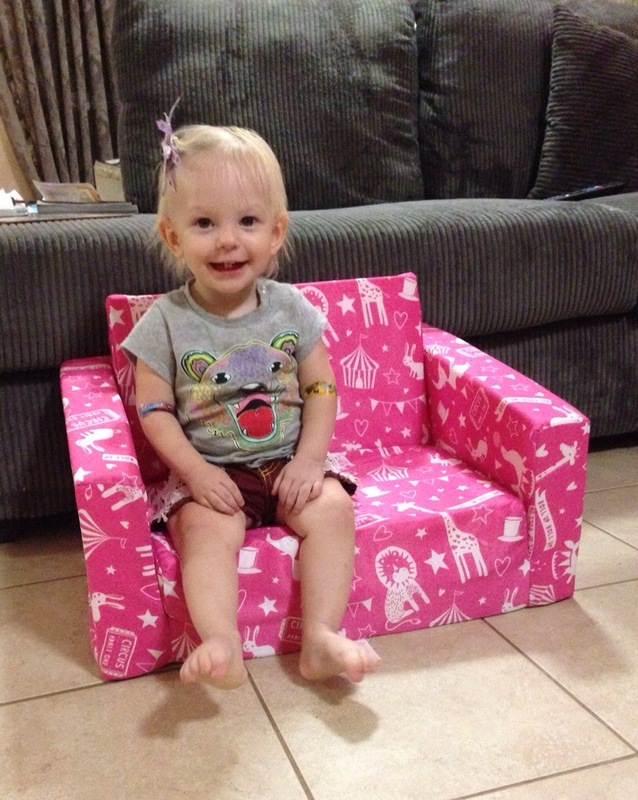 Ayla loves the little lounges at her day care centre, always showing me how she can sit or lie on one all by herself. So in our guilt Hubby and I bought her one, and it’s brightened up our day for all of us. Ayla LOVES it. She squealed when she walked in the door tonight and saw it, assumably forgetting that she had it. She spent the next half an hour climbing, lying and sitting all over it, getting toys and sitting them beside her, and throwing other toys down on it to watch them bounce. I know Ayla probably doesn’t realise that the pretty pink couch is in recognition of her bravery, resilience and forgiveness, but Hubby and I do.